Anyone involved in training-teaching-learning knows that Levine’s observation about hallways (and, by extension, other spaces such as the conference Networking Uncommons and exhibits areas) parallels conclusions firmly grounded in research done on informal learning in our workplaces. And anyone who habitually participates in conferences arranged by the organizations serving specific professions (ALA for libraries, ASTD for trainer-teacher-learners, and many others) know that those hallways are increasingly blended to combine onsite and online interactions via Twitter and a variety of other tools to respond to those who might otherwise feel left behind. 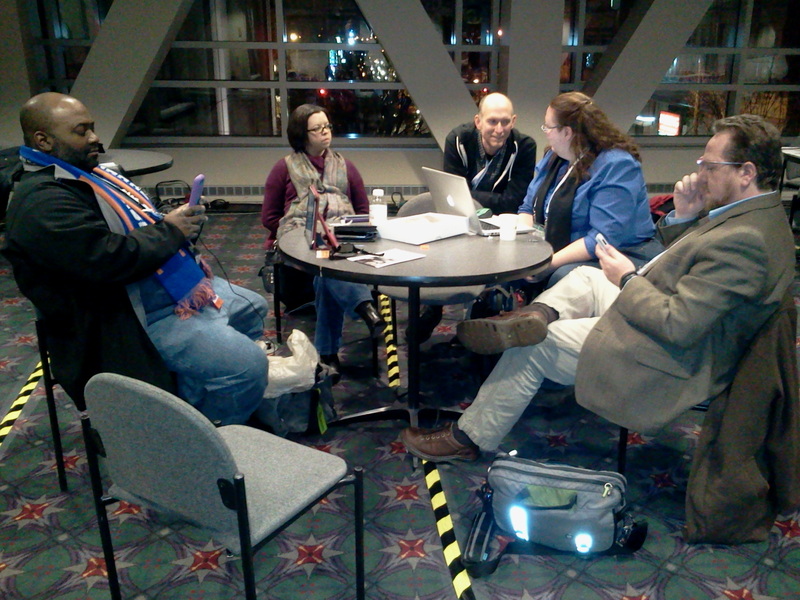 My own informal learning at the ALA 2014 Midwinter meeting began on Friday—the first full day of the conference—when I decided to visit the Networking Uncommons before the exhibits area opened. The fact that I never made it to the exhibits area—one of my favorite informal learning spaces—that evening is a testament to what ALA Strategy Guide Jenny Levine has created: Finding a group of colleagues engaged in an impromptu conversation about technology in libraries, I realized I didn’t have to cruise the aisles of the exhibits hall to meet those colleagues—the group of people I needed and wanted to be seeing were gathered right there in the Uncommons. The same thing happened the following morning when I walked over to the cavernous area housing the ALA onsite bookstore, the conference registration desk, and an area being used for demonstrations of Google Glass. On assignment for the American Libraries blog, I was hoping to photograph a few people trying that wearable technology, interview them, and learn more about how Google Glass might be a useful tool in the work my colleagues and I do. With my usual good luck, I arrived just a few minutes before former ALA President Barbara Ford did, so I was able to photograph her trying the device and then conducted a follow-up interview that was included in that blog article providing readers with projections of how the voice-activated device might work its way into libraries and other learning environments dedicated to facilitating training-teaching-learning. My informal learning continued over lunch that day with Peggy Barber, a cherished colleague who always manages to bring me up to date on something I wasn’t smart enough to be exploring on my own. She had recently published an article on “contagious marketing” in American Libraries, so I asked her about one of the sources she had quoted (Jonah Berger’s Contagious: Why Things Catch On) and told her about a similar book I had read a few years before (Chip and Dan Heath’s Made to Stick: Why Some Ideas Survive and Others Die). What we learned informally from each other over lunch will deepen as each of us reads the book recommended by the other. The sort of expanded onsite-online hallways I’ve noticed at earlier conferences reappeared while I was attending an onsite session Sunday morning on ALA’s “Libraries Transforming Communities” initiative. Presenters Maureen Sullivan and Cheryl Gorman. As they were discussing the positive impact the initiative has had in fostering collaborations and partnerships between libraries, library staff, and members of the communities they serve, I tweeted out summaries of some of the highlights. Some of those tweets were immediately retweeted by other conference attendees so that the information reached a larger audience than might otherwise have been possible, and at one point a tweet attracted a response from a novelist who objected to a comment made by one of the presenters. Seizing the opportunity to further expand the conversation, I read the comment to Sullivan and Gorman during a question-and-answer period, took notes on their response, and condensed it into a tweet to briefly extend the conversation with the novelist. The informal learning that morning traveled down some very long and intriguing ALA hallways that eventually drew responses from colleagues who aren’t even formally affiliated with ALA.
As long as those hallways that Levine and many others help create are available, I will be exploring them. And reporting informally on what I learn. This entry was posted on Tuesday, January 28th, 2014 at 12:02 am and is filed under libraries, training. You can follow any responses to this entry through the RSS 2.0 feed. You can leave a response, or trackback from your own site.